One of the main reasons why we enjoy watching videos on our iPhone is because of the high-quality way how it is able to display the produced digital content. Despite of the screen being rather small, it still gives a satisfying output which is ideal for viewing. However when it comes to the moment that your friends, family members, or colleagues want to watch the videos all together, what should you do? In this case, you can endure the option of watching that video on the small screen of your iPhone, or somehow manage to play iPhone video on PC. If you choose the latter, then you’re probably wondering how you can do this. You have practically two options: one is to stream your iPhone screen to PC, and the other is to transfer the video files themselves physically to PC. Either way, you can successfully share your videos with other people in a more convenient manner. In order to learn more about this, see the detailed guide included in this article. If you decide on exploring the first way to view your videos on PC, our best recommendation for you is to use a streaming application called Apowersoft iPhone/iPad Recorder. This is an easy-to-use application because it does not require phone jailbreak unlike others. Also, it connects your phone without using USB cable. When it comes to displaying the video on the larger screen, it provides clear graphics while casting. In fact, you can view your videos on computer just like how they are being played on the iPhone. The only difference is that you’re playing them on the bigger screen. 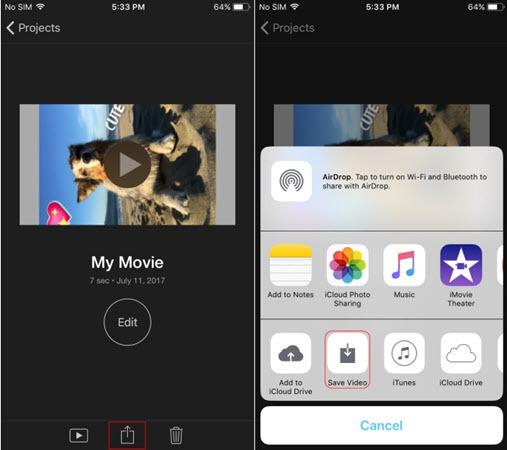 Without further ado, follow the steps below to know how to play movie from iPhone to computer. Install and launch Apowersoft iPhone/iPad Recorder on your computer. Connect your iPhone by opening the “Control Center” and tapping on “AirPlay”. Select Apowersoft with your device name inside a parenthesis and you will see your iPhone screen cast on your computer. Once your phone is connected, play the videos and enjoy watching. With these simple steps, you are able to share your videos with your friends or co-workers. In the event that you want to record your screen activities, you may hit the red “Record” button. But if you just want to take screenshots, there’s a separate button that can easily capture the ongoing activities on your screen. Besides using the first method to play iPhone video on PC, you can also decide on just transferring your videos directly from iPhone to PC. The easiest way to do this is by using AirMore. AirMore is a file transferring tool which can be used between iPhone/Android and a computer. This is an application that utilizes the web, which is advantageous for the reason that you can use it on Mac or Windows in the same manner. Moreover, you don’t need to install any software onto your PC to run this application, but you can similarly transfer pictures, music, videos, documents, and other files stored on your mobile. 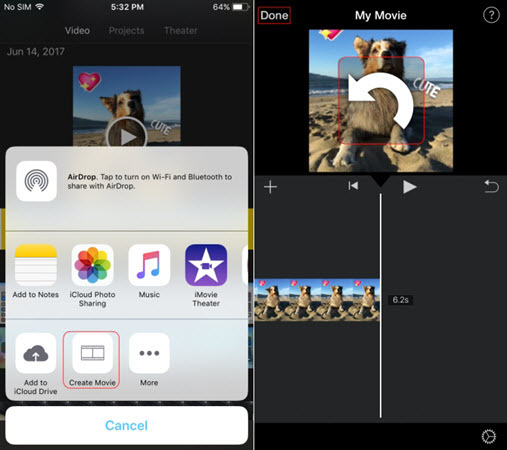 By using this tool, you can now play iPhone video on computer. To find out how, refer to the guide. Go to AirMore on your browser, download and install AirMore on your iPhone. Click on the “Launch AirMore Web to Connect” button. Once the QR code appears, open the AirMore app on your iPhone and click on “Scan to connect” for connecting. 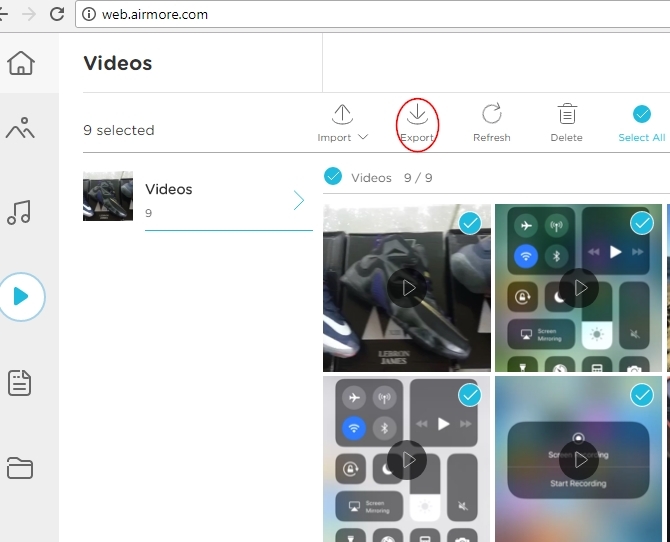 On AirMore Web, select the Videos tab to view all the videos stored on your phone. Select the files you want to transfer and then hit the “Export” button. Click on “Disconnect” after exporting your videos. Double click on the videos after transferred onto your PC to play. 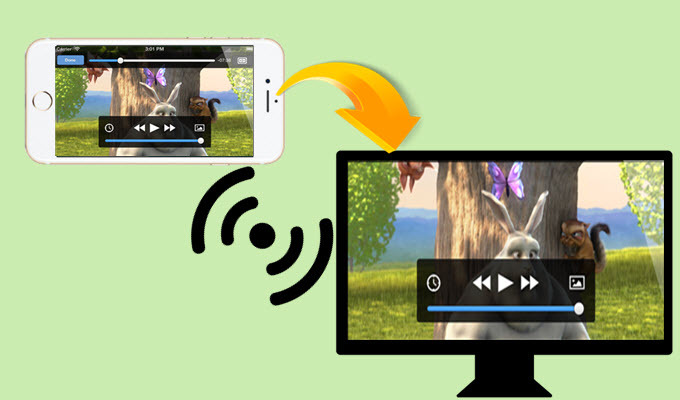 After transferring your file, you will finally be able to play video from iPhone to PC. However, there might be instances when your exported videos are upside down or sideways. In order to avoid this, before moving your files to PC, rotate them with iMovie. Firstly, open the video you want to rotate on the iMovie app. You can do this by going to the Videos app on your iPhone and tapping on “Share” > “Create Movie”. Once loaded, you can rotate your video. Tap and hold the video with your two fingers and then rotate clockwise or counter-clockwise, when a white arrow will appear that indicates to which direction you are rotating. After that, release the video and click on “Done”. Finally, tap on the “Share” button and select “Save Video”. If you’ve corrected all your videos by this method, you can transfer them to your computer. 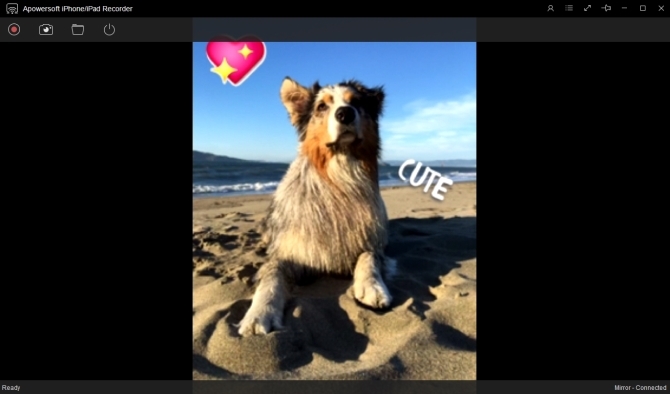 Whether you use the first or second method, you’ll be able to watch iPhone videos on computer. To compare, it’s more practical to use streaming applications like Apowersoft iPhone/iPad Recorder for different reasons, one of which is to avoid the issue of compatibility. We all know that the pictures, videos, and music on iOS devices have different formats compared to the usual types which Android smartphones use. This is why most of the time iPhone videos won’t play on your computer. Therefore it is advisable to use a mirroring application because you can directly play your videos on iPhone in that case. Another benefit of using Apowersoft iPhone/iPad Recorder is that you can control the playback without moving your mouse and keyboard. Meaning, you can easily select what movies to watch. Thus, even when you are sitting far away from the monitor, you’ll be able to adjust the volume or skip boring parts on your videos.